The impact the American first ladies had on their husbands and nation will be explored in a new C-SPAN series, "First Ladies: Influence & Image," airing Monday night. WASHINGTON – Special advisers, lawmakers and lobbyists chirp into the president’s ear all day, persuading him on decisions that could change the course of history. But at the end of the day, the person who has the most sway is the one who kisses him goodnight. The impact the American first ladies had on their husbands and nation will be explored in a yearlong series, “First Ladies: Influence & Image,” produced by C-SPAN and the White House Historical Association. The first 90- minute episode premieres Feb. 25 with Martha Washington, and the series will highlight each first lady in chronological order, ending with Michelle Obama on Feb. 10, 2014. C-SPAN Executive Producer Mark Farkas describes the first-of-its-kind series as a “chance to walk in the shoes of the first ladies” and see how they shaped the direction of the Oval Office. “Some of these (men) wouldn’t have been president if they hadn’t had this partner who was urging them on, and sometimes may have been more of a drive for them to be governor, or a politician or even a president then they may have had,” says Farkas in a conference room at C- SPAN headquarters on Capitol Hill. 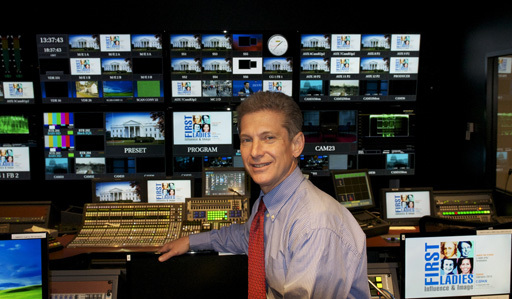 In his 28-year career at C-SPAN, Farkas, 52, has produced award-winning series on United States presidents, libraries, authors and even presidential candidates who lost the election but may have been a better president in hindsight. “First Ladies: Influence & Image” is the first production led by Farkas in which women will get time in the spotlight. Farkas, who lives in Fairfax, Va., says there is no comparable series on the first ladies that explores topics ranging from the dresses they wore to the causes they championed during their time before and after the White House. While many Americans may know about Jackie Kennedy’s iconic fashion sense or Lady Bird Johnson’s beautification efforts, Farkas promises the program will delve into stories not written in history books. “There is another side to every single one of these first ladies,” he says. Richard Norton Smith, a presidential historian and head of five presidential libraries, has worked with Farkas on previous productions and proposed the idea for the series. Though some first ladies chose to stay out of their husband’s political arena, many entered it full- force. Sarah Polk was one of them. Historians say she refused to marry James Polk until he gained political office. Once he became president in 1845, she lobbied in the halls of Congress for her husband’s causes, took notes on newspaper articles for him and edited his speeches. “There are women like Sarah Polk throughout this series who behind the scenes are very, very active in helping their husband form opinions about cabinet secretaries, bills on the Hill (and) different congressmen,” Farkas says. Claudia Alta “Lady Bird” Johnson had no trouble giving Lyndon B. Johnson her honest opinion on presidential matters. After one of his speeches, Mrs. Johnson called her husband in the Oval Office and ruthlessly critiqued his performance. President Johnson took the criticism like a school boy, Smith says. “There’s no one else in Washington who could have talked to LBJ that way,” he explains. Edith Mayo, curator emeritus of the Smithsonian’s National Museum of American History, describes Mrs. Madison’s entertaining as a form of politicking. “She provided that kind of congenial atmosphere in which views could be aired and problems could be solved in a way that was not possible if (lawmakers) only had the political sphere in which to do that,” Mayo says. Though it may sound like fun to dress up and host White House soirees, the role of first lady is far from fun and games. First lady Margaret Truman once said it was the second-hardest job in America. As Smith explains, the “job is undefined” and certainly not spelled out in the Constitution. The women who hold the title are subject to criticism about their taste in furniture, the causes they adopt and the way they raise their children. But the one topic that gets all of America talking: their fashion. And even on that subject, history tends to repeat itself. “Mamie Eisenhower set off a rage for Mamie bangs 60 years before Michelle Obama’s bangs were being talked about,” Smith says, referring to Michelle Obama’s hair cut that recently made national headlines. Mayo, who curated the first ladies exhibit at the Smithsonian from 1992 to 2006, says Michelle Obama, like many first ladies before her, is changing the fashion landscape. By shopping at stores like H&M, Mrs. Obama is making a statement that women in America don’t need to purchase designer clothes to look classy. “In other words, you don’t have to be Nancy Regan and have been a previous movie star, or Jacqueline Kennedy with all the Kennedy wealth, in order to dress well,” Mayo says. Fashion accessories — like earrings made from Elizabeth Monroe’s hair that she gave to her sister – – will make an appearance in the series, but Farkas says it’s the descendents who help humanize the women. For example, the production crew visited a man in his 80s who lives in Sherwood Forest, Va. The man, Harrison Ruffin Tyler, is the grandson of John and Julia Tyler, who lived in the White House in 1845. Family stories that come straight out of relatives’ mouths bring an element to the show that the historians on set can’t provide, Farkas says. “To hear John Tyler and Julia Tyler’s grandson talk about the story of how they met out on the Potomac on a boat when her father was killed, it’s touching and it feels personal,” Farkas says. He adds that tragedy and family loss are two themes that thread through the series. Take Franklin and Jane Pierce. The couple lost two sons before Franklin Pierce took office in 1853. On the train ride to Washington, their only remaining child, an 11 year old named Bennie, was catapulted out of the train during a crash and died before their eyes. Mrs. Pierce, who didn’t want her husband to be president in the first place, connected her husband’s presidency with losing her son. “It completely taints her time as first lady,” Farkas says. First lady Anna Harrison didn’t even make it to Washington. Her husband William Henry Harrison died 32 days into his term after catching pneumonia. In addition to the private moments, the series highlights the causes championed by each first lady. While historians say it’s difficult to point out one first lady who had the largest impact on the nation, many say Eleanor Roosevelt — who spoke up for women, African-Americans and the working class — set the example for her successors. Mrs. Roosevelt was also the first first lady to hold press conferences — but only for an audience of female reporters. The significance wasn’t lost on Farkas. Farkas calls the first ladies “good barometers” of important issues affecting women in the country. The series is a chance to showcase women’s history, and the first ladies provide a hook that will reel in an audience, he says. “I’ve got two teenage daughters and they may not be interested in a lot of what I’ve done at C-SPAN over the years, but when I told them about first ladies, their ears perked up,” he says. One of Farkas’ goals it to form an image of each first lady by using her own words. The first half of the series — which ends with Ida McKinley on June 10 — will rely on letters and written materials. As the shows transition into the 21st century, the live program and taped portions will incorporate audio and footage of the women. The crew also plans to interview the six living first ladies. While Farkas could describe the first episode on Martha Washington which opens at Mount Vernon, he’s not sure what Michelle Obama’s segment will entail a year from now. “Her story is still being told,” he says. A special preview episode airs Feb. 18 at 9 p.m. on C-SPAN. February. Here\’s a look at some of the first ladies throughout history.